Make your house smell fresh anytime of the year with this lavender sachet from Craftster.org. You can switch it up by using different types of potpourri, and when you’ve finished your stitching you can place these inside drawers, in corners of the house, or in the bathroom. Freshen up your house with a springtime smell. Cut out your pieces. I used 4×4 inch squares just because. You can really make them whatever size you feel is best. Next, pin your pieces, right sides together, and start sewing about an inch from the corner. You’re going to sew all the way around until you get to the side you started on and sew about an inch down that side and stop. Obviously if your sachet is a different shape you can sew less than or more than one inch, you just need to have a decent sized opening left. If you can remember, clip your fabric corners then turn inside out. (I say if you remember because while I was making this tute, I didn’t think about it.) You can see that when you turn it inside out, the fabric folds and doesn’t stick out all wonky. This is very helpful. Next, you’re going to topstitch the same way you already stitched the pieces together. Leaving the opening open. Now, take your 3×5 card and fold it in half. Put your lavender on the card. Here’s how I put it in. I put the lavender/rice in the folded card and stuck the card in this way. Then I flipped it and squished the card open (if that makes any sense). Make sure it isn’t too awfully full because you want to machine sew it shut. Just line up your previous topstitching and basically connect the dots. 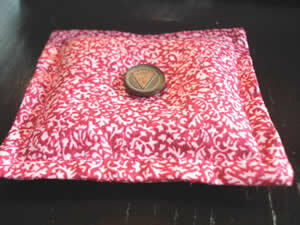 It still needed something, though, so I took a vintage button and a regular button and sewed them in the middle.